Power through the toughest porcelain, stone and masonry up to 2-1/4 in. 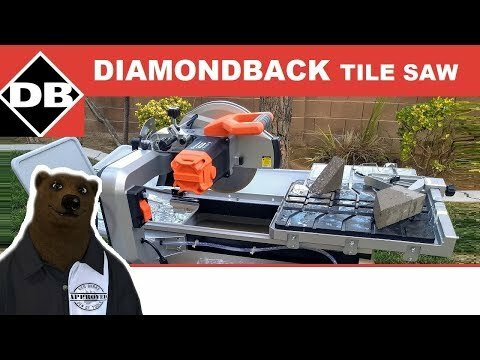 thick with the Diamondback DB070-1 Wet Tile Saw. The Diamondback 7 in. Wet Tile saw was built with an impressive 1.5 HP delivering 6000 RPMcapable of powering through the toughest of porcelain, stone and masonry up to 2-1/4 in. thick all in a lightweight design. The non-slip sliding table with sealed ball bearings allow for a rip capacity of 24 in. and 18 in. on the diagonal. This saw also features oversized splash tables that contains cutting debris for easy cleanup. An efficient water management system with a high volume industrial water pump delivers optimum water flow to the blade for vibration and chip free cuts. Included Diamondback Professional 7 in. Blade.